Less and less Christian demographically, America is now home to an ever-larger number of people who say they identify with no religion at all. These non-Christians have increasingly been demanding their full participation in public life, bringing their arguments all the way to the Supreme Court. The law is on their side, but that doesn't mean that their attempts are not met with suspicion or outright hostility. 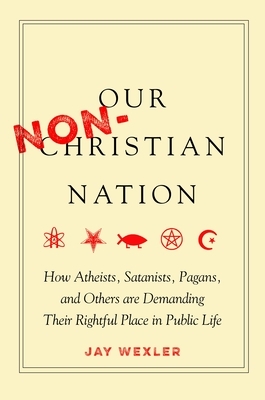 In Our Non-Christian Nation, Jay Wexler travels the country to engage the non-Christians who have called on us to maintain our ideals of inclusivity and diversity. With his characteristic sympathy and humor, he introduces us to the Summum and their Seven Aphorisms, a Wiccan priestess who would deck her City Hall with a pagan holiday wreath, and other determined champions of free religious expression. As Wexler reminds us, anyone who cares about pluralism, equality, and fairness should support a public square filled with a variety of religious and nonreligious voices. The stakes are nothing short of long-term social peace. A Professor at Boston University School of Law, Jay Wexler is also a humorist, short story writer, and novelist. A one-time clerk to Justice Ruth Bader Ginsburg and former lawyer at the US Department of Justice, he has written for National Geographic, The Boston Globe, McSweeney's Internet Tendency, Salon, and many other outlets. His books include When God Isn't Green (2016) and Holy Hullabaloos.